Medical Proof that Cellular Level Healing works! Here are thermogram scans from one of Alice McCall’s clients. Thermograms are a healthy alternative to a mammogram; to learn more about using thermograph for early detection order your copy of Wellness Wisdom. 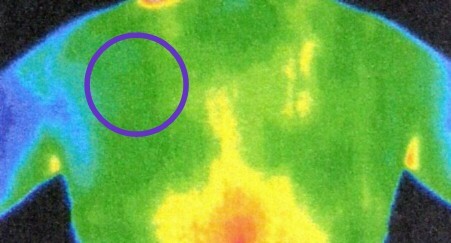 On September 2008, a hot spot in the upper left side of her back was apparent. This is an indicator of a potential health issue or disease, such as cancer. 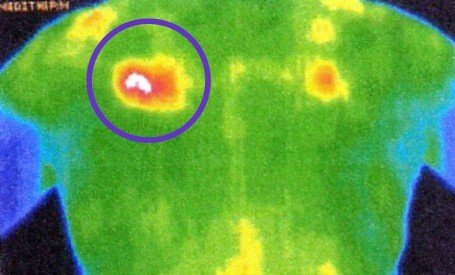 On March 2009, the client returned for another thermogram, and the hot spot was entirely gone! The green color indicates health - no heat or inflammation present! What did she do? All she did between September and March was have two sessions with Alice McCall! In these two sessions they worked at the cellular level to transform the root cause - the emotional, mental, and physical issues related to the discovered hot spot. For more proof of what Cellular Level Healing® can do, order your copy of Wellness Wisdom. It includes medical records of clients with Multiple Sclerosis and Stage 3 Lymphoma – both are considered incurable diseases but the proof is in the records!